Decorate and Ride the Horse of Your Dreams! 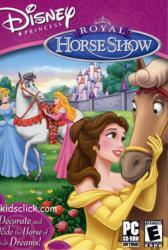 Once upon a time...Cinderella, Snow White, Aurora and Belle were preparing for a Royal Horse Show. 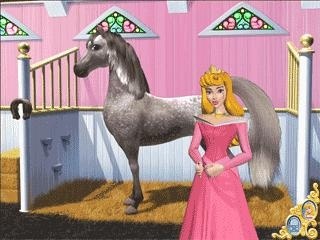 Help your Princess friends decorate and ride all the horses in the Royal Stables! 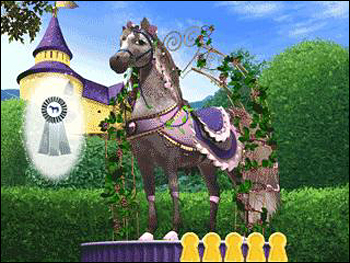 Show your graceful horses in beautiful costumes, compete in the Royal Show Ring, ride and jump over rails, hedges and water in this magical world. 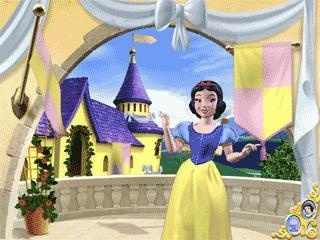 Join Cinderella, Belle, Aurora and Snow White at the Royal Fairgrounds for some enchanting fun with beautiful horses. Kids love horses and with this CD they can decorate and ride the horse of their dreams. 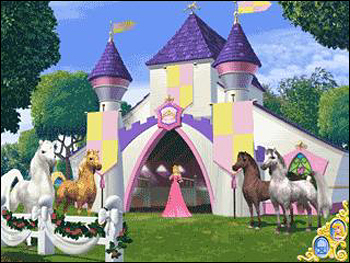 Kids will find Princess Aurora at the Royal Stables with some beautiful horses to choose from. Children choose a horse and then choose beautiful blankets, saddles, bridles and mane and tail decorations with ribbons, bows, hears and flowers. When children complete two horses they get a special surprise. At the design shop kids choose decorations for the Royal Fairgrounds. There are banners, flags, drapes, flowers and bows. Kids can even choose the music they prefer. At the show ring kids direct their horses around a track and over jumps. Players begin with the ruby gate and advance to the emerald and diamond show rings as they progress. At the craft cottage kids can see pictures of their horses and find all their awards. Pictures and certificates can be printed along with horse cards for trading. Belle tells kids all about horses when they view the horse cards. This is a magical CD that combines two things kids love, horses and fairy tale princesses. Children will spend hours decorating and riding these wonderful horses.